Ep. 68: Dr. Harold Arnold – Using his Passion to Encourage People to “Be Unfair” | Aimee J.
Dr. Harold L. Arnold, Jr., founder of The Pursuit of Influence, is a social and organizational psychologist who specializes in developing family-focused culture in homes, places of worship, and business settings. Dr. Harold is a leadership enthusiast who relishes empowering leaders to maximum influence through his weekly, “Leading You Home Podcast, blogging at HaroldArnold.com, and numerous workshops. Dr. Harold is the author of three marriage books and one leadership development book all based on his own unique model for relationship-faith integration, including Marriage ROCKS for Christian Couples, Second Shift: How to Grow Your Part-Time Passion to Full-Time Influence and his newest marriage book published by CLC Publications, The Unfair Advantage: A Grace-inspired Path to Winning at Marriage. He is currently spearheading an initiative to bring 1000 Christian couples together for spiritual and marital renewal. Harold Arnold had a good job, he worked for fifteen years in Information & Technology Systems (IT). When one day, he heard a radio program that changed his life. The program “Focus on the Family” challenged him to look at his life and consider what he really he wanted. From that moment on, Harold embarked on a journey to truly discover what he was put on this earth to accomplish. Many years later, Harold discovered his purpose and what he calls his “Why”. Fueled by this discovery, Harold is passionate about helping others find their “Why” too! Listen to this powerful episode of Chasing Dreams to hear more about Harold’s story and how you can find your “Why”! Why are you here? What is your purpose? Dr. Harold Arnold struggled with the same question. Even after he had a big “Ah-ha” moment Dr. Arnold struggled to find that “Why”. When his church started a study on Rick Warren’s “40 Days of Purpose”, Dr. Arnold began to articulate his calling. This process required many nights filled with of prayer, patience, and wise council. Once Dr. Harold found his “Why”, he focused like a laser beam on his mission to help others in their journey of faith, marriage and discovering their passion. 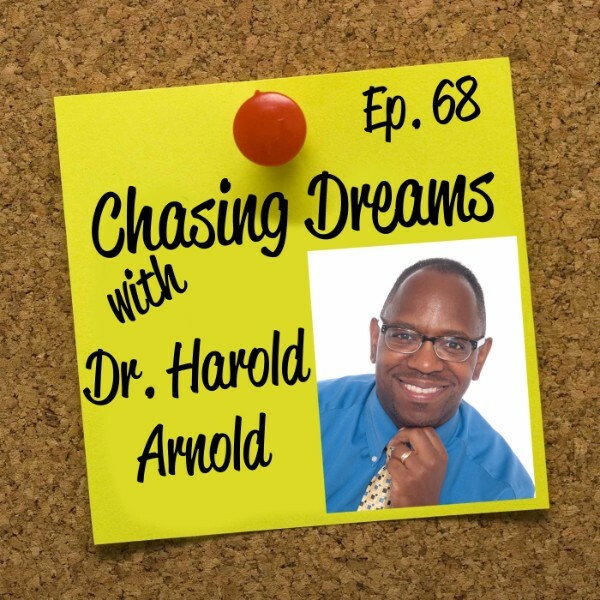 Don’t miss Dr. Arnold’s challenging lessons on this episode of Chasing Dreams! Finding your voice or unique calling can be very difficult. Once you find it, it feels amazing and you jump in with both feet! The trouble with articulating your calling can come when you find someone who is successful and doing what you want to do. You might find yourself before long, sounding like them, copying their passion instead of unleashing your own. Dr. Harold Arnold discovered that this is a common occurrence and wants to help people like you avoid this setback. In this episode of Chasing Dreams, Dr. Arnold discusses three vital steps in the process of growing and discovering your voice. Listen to good people in your circle that will help you pursue your calling. Listen to what is going on inside you. What is rumbling under the surface? Love what you have been called to do. As you are listening and discovering what that is, start doing the work. Put feet to your passion! Lead others into your calling. Lift up others along the way. Check out this podcast episode to hear more from Dr. Harold Arnold! Wouldn’t be nice to see clearly what the next step is in business and life? Rarely does life provide that kind of clarity you crave. It can seem like a mirage in the desert. What is the solution? They say hindsight is 20/20 but how does that clarity help with making decisions in the present? Lack of clarity can leave you paralyzed in fear, complacency, and comfort. Aimee and Dr. Harold Arnold discuss whether clarity is really all it's cracked up to be. Don’t miss out on their helpful conversation as they discuss the role of clarity, comfort, and taking risks! [1:05] Aimee’s introduction to this episode with Dr. Harold Arnold. [2:55] Dr. Arnold talks about writing two books in one year. [5:06] Before he became an author, Dr. Arnold worked in IT. [8:52] Dr. Arnold talks about his journey in studying for his PhD. [12:31] Amy asks about how writing has impacted Dr. Arnold. [15:35] Where did the inspiration to write come from? [21:31] It is vital that you find YOUR voice. [26:30] How the culture changes when we all find our purpose and voice. [29:58] How do you find your voice or purpose? [40:37] Dr. Arnold’s advice for those who want to chase their dreams. Never give up. It's not so much about what you achieve. We get so focused on if we achieve our goals or not, but that’s not the point! The key is, who you become along the way. You need to become your best self.